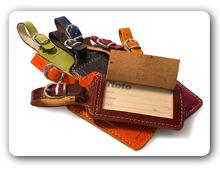 Luggage tags, also known as baggage tags, baggage checks or luggage tickets, have traditionally been used by bus, train and airline companies to route passenger luggage that is checked on to the final destination. Today companies are putting lot of emphasis in getting superior quality plastic Luggage tag printed with us. It goes a long way in creating brand awareness for the company. Our luggage tags are extremely popular with Indian and International airlines. The Luggage tags have found a lot of acceptance with the customers. Why do we need a Luggage Tag? To aid the passenger in identifying their bag among similar bags at the destination baggage carousel. As proof-still requested at a few airports-that the passenger is not removing someone else's bag from the baggage reclaim hall. As a means for the passenger and carrier to identify and trace a specific bag that has gone astray and was not delivered at the destination.